Dark_AleX’s Custom Firmware 3.02 OE-A is now here, released just a few hours ago. The installation process is similar to that of 3.02 OE-A and involves the dumping of PRX files from Official Sony Firmware 1.5 and 3.03. The files needed can be extracted easily using oeupdatemaker supplied in the 3.03 OE-A Archive. Once complete, a new file ‘DATA.DXAR’ is created which is needed to run the actual update program ‘303eoflasher’. Before installing, remember to read the instructions (found in ‘Readme.txt’) throughly before continuing so you are aware of the exact process. As always, there are risks involved when altering the firmware so ensure you follow instructions to the letter. We are not responsible for failed update attempts. Added support for compression in PSX ISOs (look at PopStation documentation for more details). Added support for decrypted document.dat (PSX games manual) (look at docmaker documentation for more details). Fixed a bug regarding free region: a stupid bug caused it not to work at all. Some generic bug fixes in the code. Fixed some bugs that could cause the brick of Korean/Chinese/Taiwan/Singapore PSP when restoring default settings. To prevent this, the region of those PSP’s are faked to Japanese when fake region is disabled. For same reason, Korean region is removed from fake region. Added Australia/New Zealand and Russia to the regions to be faked. We have just installed 3.03 OE-A on our PSP and it works just fine. We have included a screenshot of the System Information (see above). Nothing has changes from the recovery menu that we have notices. We did try and play a Region 2 UMD Movie on our Region 1 PSP and it works, though we’re not sure how good the compatibility is with all the UMD Movies available. X:/PSP/GAME150 if you are using whatever version of 2.71 SE or 3.02 OE. Download the 1.50 and 3.03 Sony Firmwares anc copy them to the ‘oeupdmaker’ folder with the names "150.PBP" and "303.PBP", respectively. The program will verify that the SHA-1 of the generated file is correct once the extraction is complete. Once that you have done this, you can save the DATA.DXAR file to skip this step in the future. The process of generating the DATA.DXAR file will only take a few minutes. Copy the generated DATA.DXAR file into the ‘oeflasher’ directory. and will return to the XMB. If you have battery problems, you can bypass this check, at your own risk, by executing the flasher program with triangle and the L-trigger pressed. The program will then show an agreement. Press X to continue the installation process flash the custom firmware, or R to cancel and exit to the XMB. If you accept, the program will flash the custom firmware. During the flashing process, DO NOT shutdown the PSP or remove the Memory Stick, doing either will brick your PSP. Once the flashing process is complete (usually takes a few minutes), shutdown the PSP and restart to 3.03 OE. 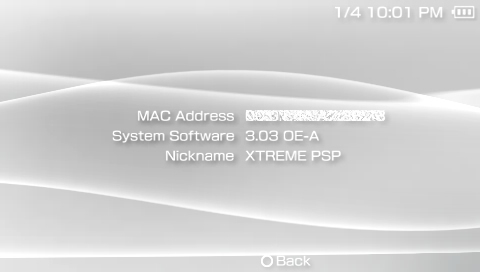 Copy the ‘oe_a2update’ folder to X:/PSP/GAME150. Run the program from the PSP XMB. DO NOT shutdown the PSP or remove the Memory Stick until the update has complete. Once complete (update will only take a minute), restart the PSP. Just flashed my PSP, works like a charm. The battle animation on Final Fantasy VII has gone, but the cursor has been fixed in battle. Sony still need to work on the PSX Emulator to roll out all the bugs. i have a legit 3.03 firmware and want to down grade it is this the right software? You can run homebrew of 4gb/8gb memory cards using 3.03 OE. You can’t downgrade from Official Firmware 3.03 since there is no exploit. For me all that is not in english. Can sumone please explain this process clearly?im currently running 2.71 SE-B.wat must i do??? found a nice site with everythin explained properly. create a new folder called “GAME150” in the GAME folder. All should be fine then.